It was a gray, blustery, showery day, but that didn't dampen our spirits, once underway. Steve and I both are such suckers for geography we felt like four-year-olds about to sit on Santa's lap, as we entered that famous channel between the Atlantic Ocean and the Mediterranean Sea. Steve marveled over its historic significance (“The most strategically important waterway in human history!”) while I goggled over the misty coasts — Africa on my right, Europe on my left, both easily visible. On that right-hand coast, I could disembark and WALK to the pyramids of Egypt, the mountain gorillas of Uganda, the gold mines of Johannesburg (if I were crazy, and the logistics weren't an issue.) Ranging out from other side would take me back to Paris and beyond. Lugging all that stuff and needing to find someplace to buy euros and having trouble finding the actual entrance into the bus depot, we took more like 30 minutes to reach the slot where the local bus would arrive. Arrive it did, and we stowed our bigger baggage in a compartment on the side and took off. Clean and modern, the bus was filled with folks gabbing away in Spanish, and as it followed the little route map we'd picked up in the terminal, we told each other it almost felt like we were back in San Diego. 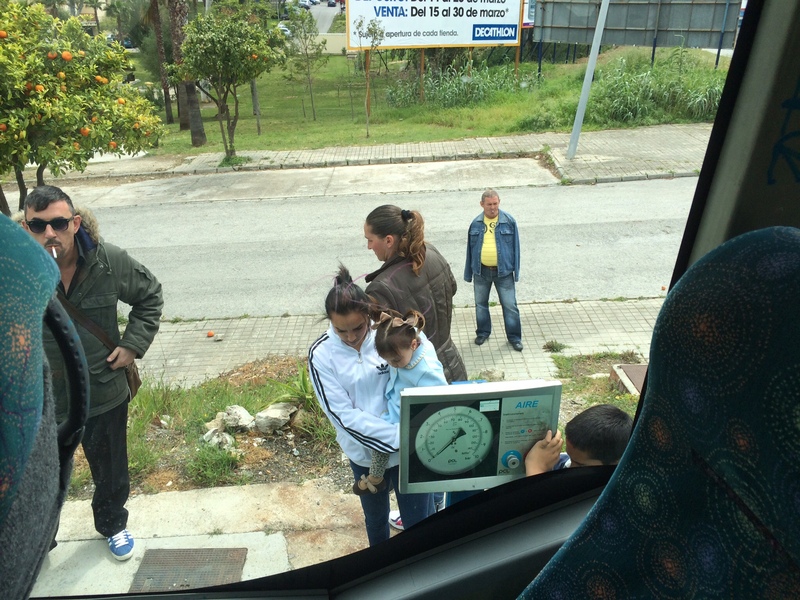 But the bus then did something I've never seen an American city bus do — it pulled off the road and into a gas station. “Is he seriously going to fill up?” we wondered. Instead the driver turned off the engine, donned a pair of yellow gloves, and walked out the front door. For a couple of minutes, nothing seemed to happen. Then a burly fellow got out of his seat and disembarked, a cell phone clamped to his ear. A couple of other guys soon followed and out the window we could see them lighting up. A guy with no arms followed them, and a women fished out a cigarette from her purse, lighted it, and stuck it in his mouth. A little boy went out and peed. A toddler girl started howling with irritation. The more time passed, the more it felt like we were caught in an Aldomovar movie. Eventually I looked out the back of the bus, where I could see that the engine cover was open, and a gaggle of passengers was watching the driver work. — Spaniards have happier fast-food options than Americans do. Among the drink options was beer, available in three sizes. 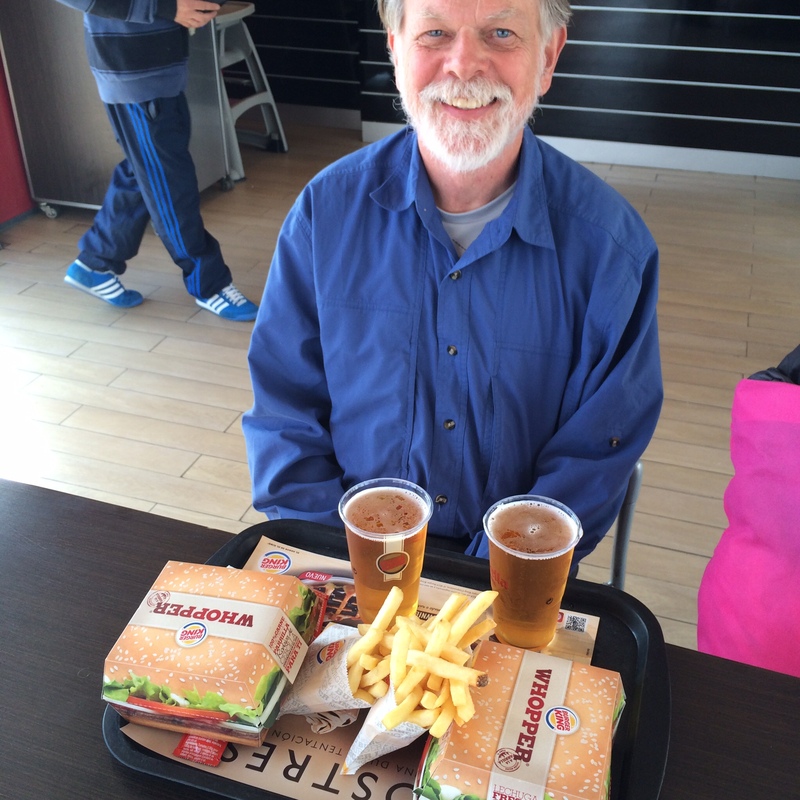 I tried to order two Whoppers, one small fries, and two small beers, and the girls behind the counter advised that it would be cheaper to order two of the 6-euro ($8.50) meal deals. “Those come with beers?” I was incredulous. They did indeed. The rest was easy again. 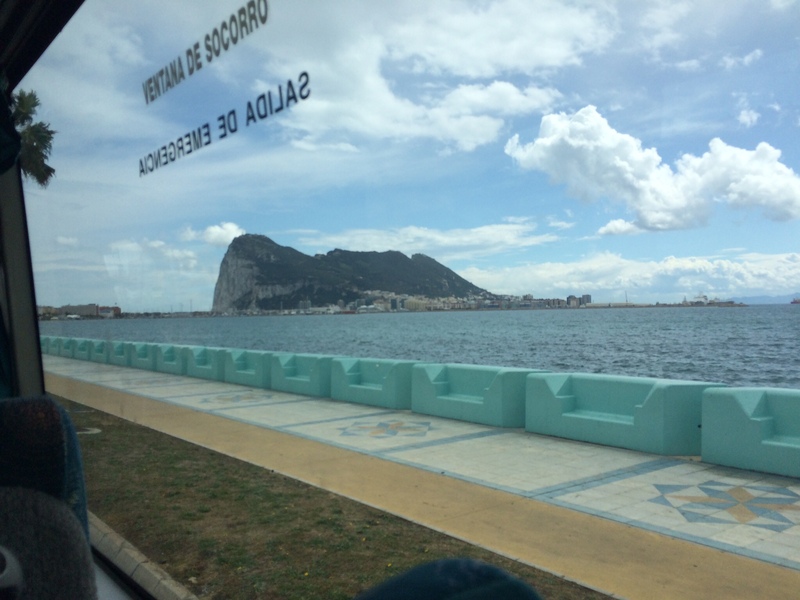 I changed dollars to British pounds (the currency of Gibraltar) just outside the crossing, then we breezed through; the solitary policeman barely glancing at our passports. A few steps further, and we confronted a bright red, classic British telephone booth. 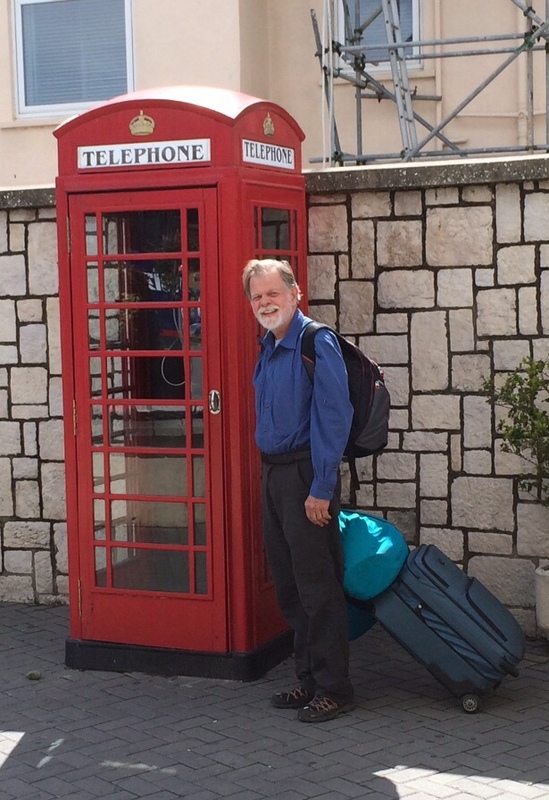 We found similar phone booths at many places in Gibraltar, despite the fact that almost everyone in the world now uses cell phones. I guess they symbolize the old Gibraltar — and maybe the present one too. Another bend in the road, another surprising facet of this country. Our bus from Fes took us through verdant, bountiful farm country, but finally we approached the Rif Mountains, a brawny land that made Steve and me feel we were deep within the Rockies. After about 90 minutes, we pulled into a rest stop, where everyone rushed out to use the toilets but then dawdled to smoke and buy snacks and gab. When the driver finally climbed back aboard, he discovered that one passenger was missing. He tooted the horn (and tooted and tooted) and then searched the rest stop for him. Then he gave up and we trundled onto the road again. It struck me that the TSA would be more suspicious of a passenger who simply disappeared. But the bus didn't blow up, and we reached Chefchaouen only about 40 minutes late. We took a local taxi to the gate of the walled city to which our B&B had directed us, and I telephoned the proprietor from the the taxi. Carlos, originally from Malaga (Spain), awaited us at the gate. He took some of our bags and led us through the steep, narrow, very blue passages leading to his place, the Casa La Palma. 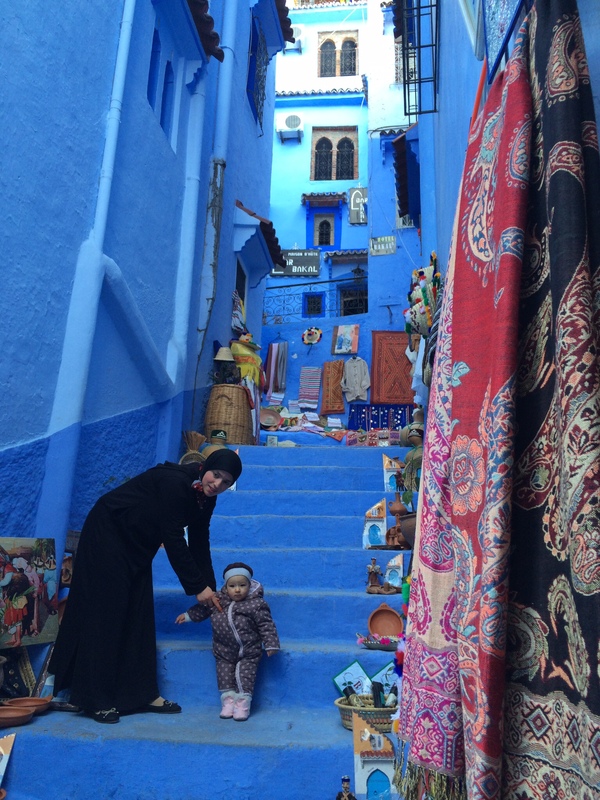 Most of Chefchaouen is blue — it's the town's signature, begun around 85 years ago, when a community of Moroccan Jews moved in and chose that color to contrast with the green tones of Islam. (In the centuries before then, this was a holy city, closed to all but Muslims.) 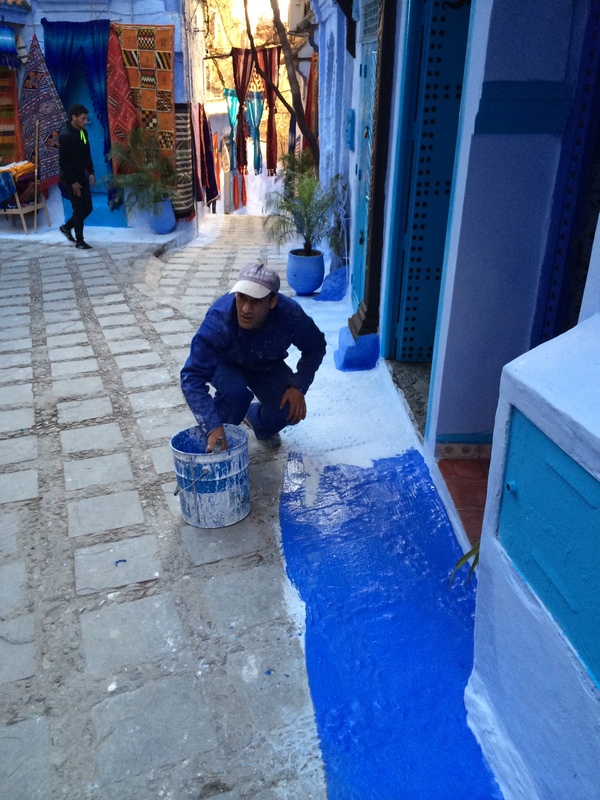 The blue tones have spread, and today Chefchaouen is a UNESCO World Heritage Site and one of the fastest-growing tourist destinations in Morocco. 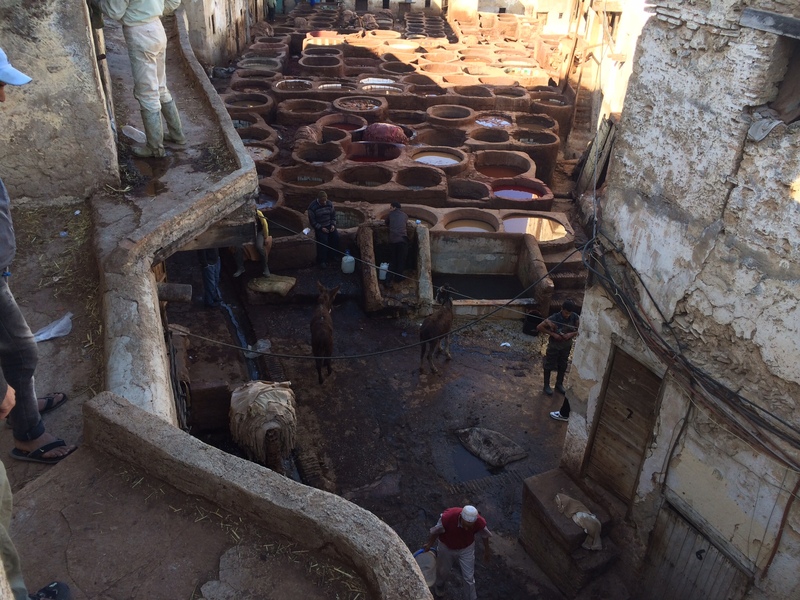 I had thought nothing could be more picturesque than Fes, but this was picturesque in a completely different (clean! bucolic!) way. I commented to Carlos that I was sorry we had only one night here. He shrugged. The town was a good base for trekking in the mountains, he said. 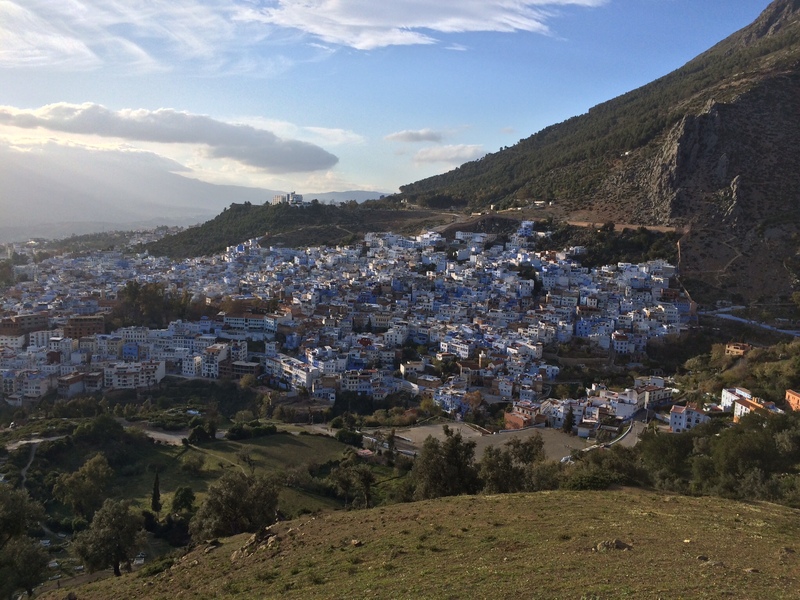 But a day or a day and a half was plenty of time to see Chefchaouen. In the guesthouse, he took our passports and filled out the official forms, then he offered to show us the way to the center of the village. He had to go there anyway, he said, to turn in the forms that day (required for Americans and certain categories of suspicious Arabs). He didn't know about our backgrounds, but he mentioned that if a guest was a journalist, the police required that he call them immediately. (Fortunately, Steve's an Engineer, and I'm a Technical Writer.) Police paranoia was running even higher than normal because the queen of Morocco was coming to visit the next day with some dignitary from Qatar in tow. Carlos had said there were three restaurants in the town where we were unlikely to get food poisoning. We asked if we could bring the bottle of wine that we had bought back in Marrakesh (and were tired of lugging around). He told us we'd have no problem drinking it at one of the restaurants, so we went to that one around 7:45 p.m.
No one was in the joint, and we smelled nothing to suggest anyone was cooking. But a girl led us to a table and gave us menus. After a long time, the friendly proprietor finally appeared to take our orders. He didn't bat an eye when we asked if we could drink our wine. But he went away and didn't reappear with a corkscrew. Another long, long interval elapsed before he finally brought Steve's soup and my green pepper and tomato salad. We asked about the corkscrew and he looked alarmed; tourists who brought wine usually brought the corkscrew too. (We couldn't because the TSA doesn't permit them in carry-ons.) The restaurateur offered to check with a neighbor. Ten minutes later, he reported having no luck. But he called a friend who offered to bring the corkscrew from across town. 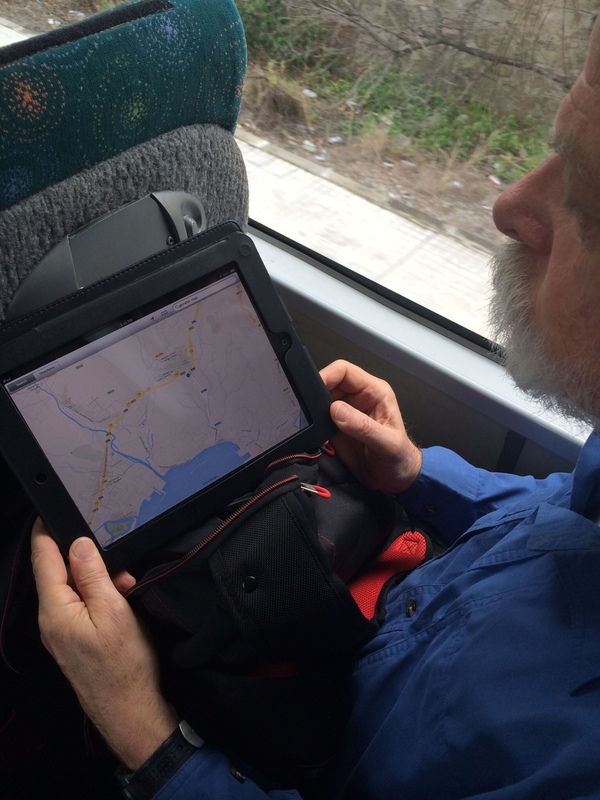 Now we're on our final bus, heading for our final stop in Morocco: Tangier. Fes wouldn't appeal to everyone. 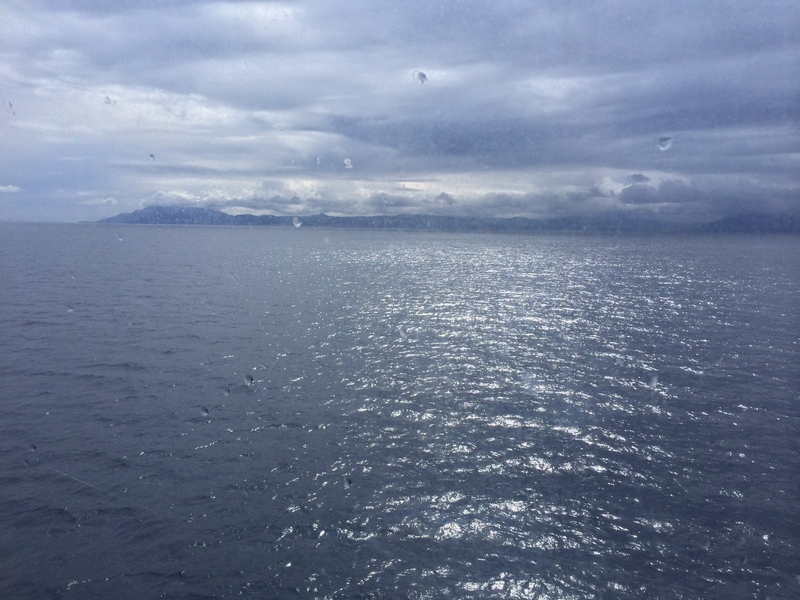 But I liked it so much I felt sad to leave. 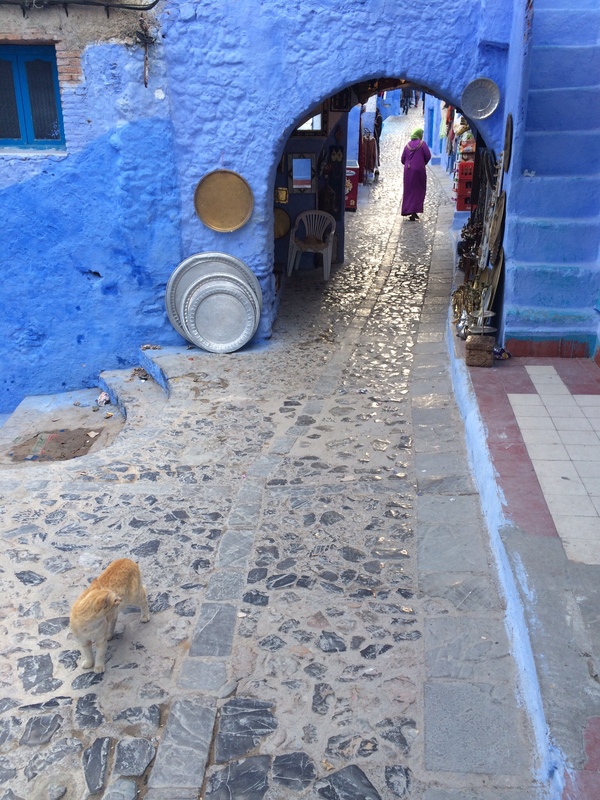 As we bounced along on the bus out of town, heading to Chefchaouen, Steve and I agreed we've never experienced any place quite like the medina — in all our travels. The closest comparison we could make was with Venice, another ancient city that's a maze of twisty narrow passages and a sanctuary from all forms of motorized traffic. I've read that Fes's medina (where we spent almost all our time) is the largest pedestrian-only zone on Earth — home to something like half a million people. But unlike Barcelona's old quarter or Venice, the Fes medina isn't an enclave of monied professionals or trust-fund babies, but home to folks who sell live chickens and cure animals skins in reeking vats of urine and pigeon excrement and beat copper into beautiful bowls and drive donkeys laden with propane cannisters, eking out livings in those and a thousand other ways. It's not really medieval. Today the streets are (mostly) lined with cobblestones, and pipes deliver running water. There's electric light, and people use cell phones and ATM machines and wi-fi. But these things have arrived within just the past few decades, and the presence of the way life was for the thousand preceding years is palpable. 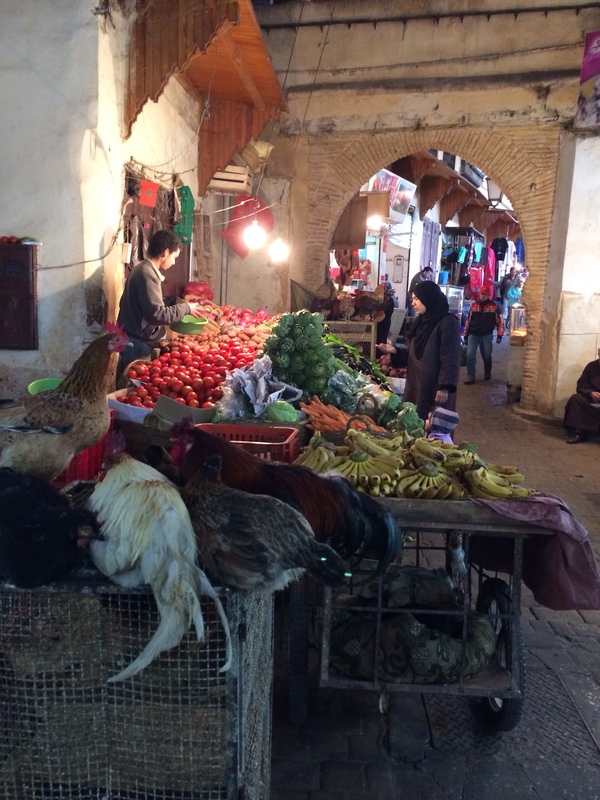 If there's a travel article or guidebook to Fes that avoids using the phrase “sensory overload,” I haven't seen it. The cliche is understandable. In addition to all the mind-boggling sights, you have to process the five times daily calls to prayer issuing from the hundreds of mosques, the crowing roosters, barking dogs, clattering and banging and sawing of the artisans. Smells issue from the tanneries, from the sizzling donuts, from the hens and pigeons whose necks have just been wrung. As in Venice, there are things to buy for prices ranging from pennies to the equivalent of thousands of dollars. Some of it is beautiful; much interesting, and a thousand touts do their best to convince you to at least have a look. 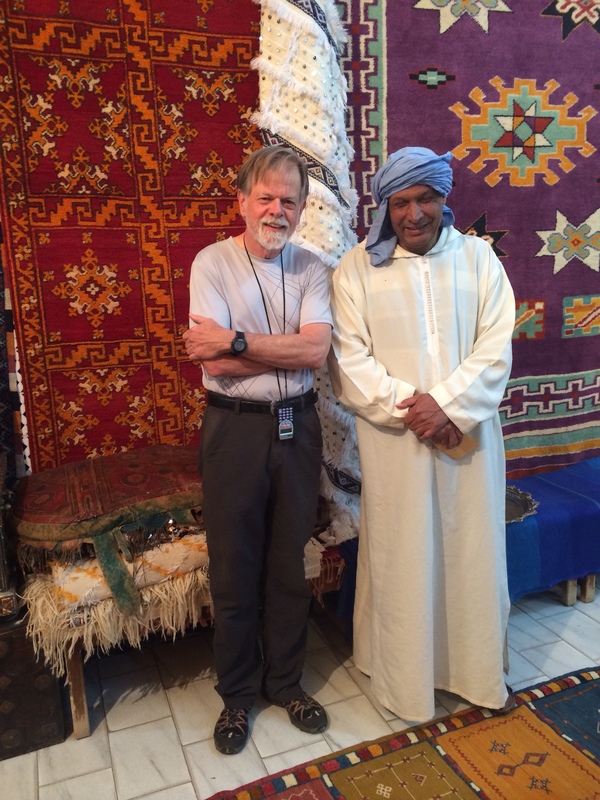 Through our riad, Steve and I hired a guide Tuesday morning to help us get oriented. We regretted it. Rachid was a slick operator, one of the most manipulative people I've ever met, and I'm still fretting that he tricked us into paying too much for the ceiling lamps we never intended to buy (but which WILL look cool in our African-themed guest room, assuming they still work when we get them home.) After that, we wandered on our own, marveling at the chance to see full chains of production in the space of a short stroll: skins newly stripped from the goats on one block, the tanned and dyed hides on another, the pretty goat leather purses and wallets and soft slippers (by the thousands) a little further along the way. We loved watching weavers working at antique shuttle-fly looms and seeing their jewel-colored handiwork stacked up on the nearby shelves. In two long days, we never got sick of it. But every time we returned to Dar Serrarine that brought a different kind of pleasure. At one point, we looked through an album full of photos of what the place looked like when Allah and Katie bought it back in the early 2000s. The walls were stained and dingy; tiles were missing, woodwork broken. Allah worked alongside the artisans whom he hired, and it took three years to make it presentable for the first guests. Seven years later, it occupies a very short list of the most sumptuous places we've ever slept in. At the same time, it felt homey. The kitchen was a few steps from the grand inner courtyard, and several times I shuffled in to put a dirty glass in the sink. The high point came our first night, when Allah give a highly animated tour to us and the six middle-aged European pals (German, Polish, French) who were our fellow guests. Sometime after 8, when someone made a comment about being hungry, we all crammed into the kitchen to drink Moroccan beer and wine and smoke cigarettes (everyone except Steve and me). “In Iraq, you drink until 11 — and then you have dinner!” Allah exclaimed. It wasn't quite that late when we all climbed up to the rooftop dining room, but our dining companions by then somehow felt like old friends. The beef and lamb tagines were tasty; the conversation hugely entertaining. Chances are I'll never get back to Fes or Dar Seffarine. (The world is big; there's so much else to see.) But after a night like that, I was fantasizing about returning to rent my own furnished apartment in the medina and study Arabic. Rachid told us we could find one for around $400 a month. I was feeling almost cocky as Steve and I pulled into the Fes airport yesterday afternoon. In our six days on the road, we had avoided getting into any of the trouble that I knew some visitors get into (breakdowns, collisions, vandalism, speeding fines, etc.) We had decided along the way to cut our stay in Merzouga short by one day so we could drive in more leisurely fashion to Fes (say, two four-hour drives instead of one grueling day). That had worked just as we hoped. We easily spotted the turn-off for the airport and arrived around 2:15 p.m.
We didn't immediately see any sign for rental car returns, so I asked a guy in uniform and he waved me into the only parking lot in sight. But a little warning bell began to ring when no one there showed any recognition of the Malta Car name. To make matters worse, even though S and I had bought Moroccan SIM cards in Marrakech for our phones, we'd never mastered the task of figuring out how much time they had left on them (let alone buying minutes to recharge them). So both phones were out of minutes. But the guy in the parking-fee collection booth, seeing my obvious distress, dialed the number I had for Malta Car and handed his cell phone to me. I got Jawad, the owner, and it soon became clear what had gone wrong. Several more calls passed between us. Finally we suggested this solution: I would call our riad in Fes and have them send a car to pick up me and all our luggage. Steve would wait in the parking lot, reading our guidebook about Fes. He'd return the car to the driver, when he showed up. And then he'd try to talk the driver into taking him into town. If that failed, he'd get a taxi. Happily, it all worked out. The riad found a reliable driver who was already at the airport, so I had to wait almost no time at all. He drove me to the walls of the enormous old city, when we transferred the bags to a guy with a wooden cart. 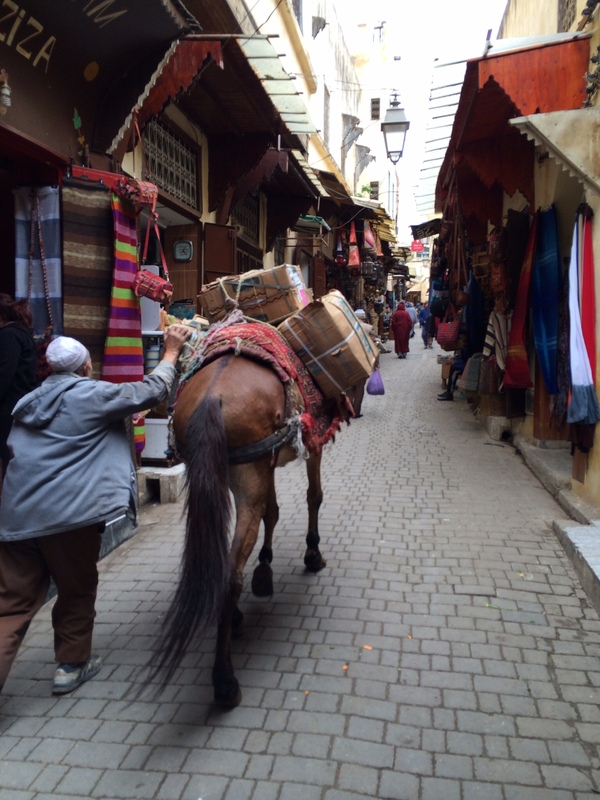 We followed him on foot through passages that seemed darker and older and far more confusing than the ones in Marrakech. Finally, at the end of a dimly lighted dead end, we rang a bell next to an impressive wooden door, and I was admitted to Dar Seffarine. We're staying here because our good friends Treacy, Erin, and Maya Lau so warmly recommended it. They'd been guests 6 or 7 years ago, shortly after the couple that owns it (Allah's an Iraqi and Kati is Norwegian) began welcoming visitors. The city of Fez is more than 1000 years old; it claims to have the oldest university in the world, founded about 700 years ago. The building that Allah and Kati bought is not far from the university, and for that reason it's believed to be about the same age. Omar in the village, Omar in the dunes. Lotta Omars in this part of the world. The youngest brother in the Seggaoui family is an Omar, and he gave us a walking tour of the village of Hassi Labied Saturday morning. Later in the day, our guide on the camel-riding camp-out in the dunes also was an Omar. What both of them showed us in the village and the desert was enlightening. 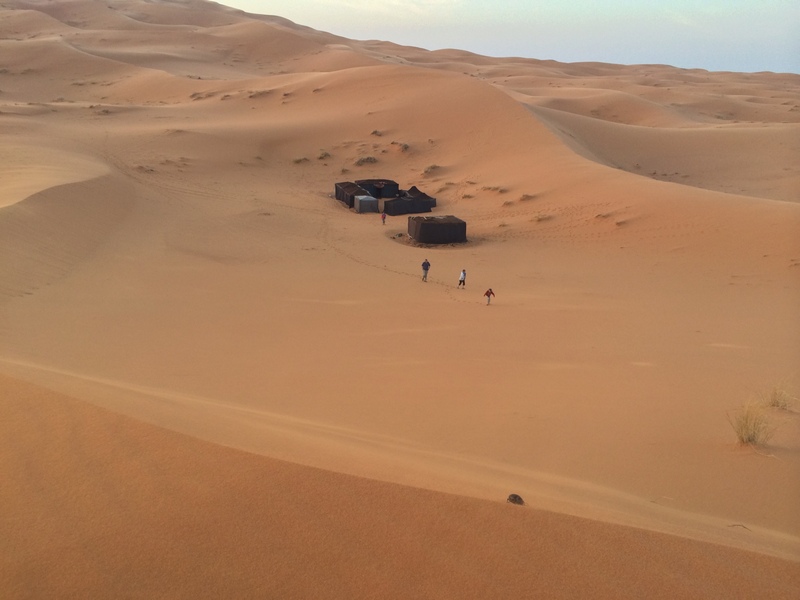 I should explain that Hassi Labied (pop: 2000) is one of the two places you go in Morocco if you want to experience quintessential Saharan sand dunes. It's about 30 miles from the Algerian border; and its dunes (Erg Cheggi) are something like 20,000 years old, (according to Village Omar). Because they were worn down from mountains, their bases are high, enabling some to reach almost 500 feet in height. Fifty years ago, only the “black desert” (a flat black basalt wasteland reminiscent of the world's biggest empty parking lot) butted up against the dunes. But sometime around the mid-1960s, the region experienced a drought so terrible that Omar's parents and about 60 other Berber families decided they could no longer pursue their lives as nomads. 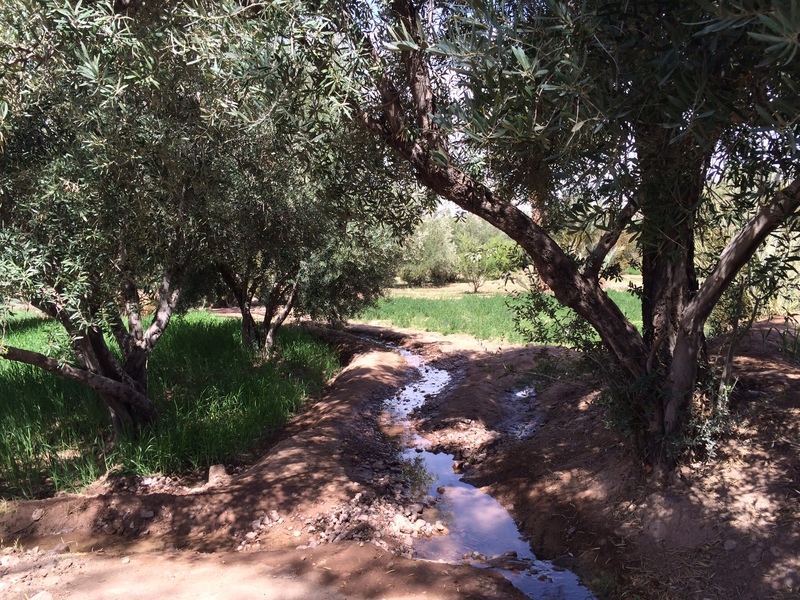 They had identified an underground spring in the dunes not far from where the village now stands, so they built one of the underground aqueducts that provides the lifeblood to many Moroccan oases. They divided up the land into 60 small plots where each family could grow date palms (the only cash crop in this area) and raise carrots, beans, mint, onions, barley,and other small crops for their personal consumption. Around these plots, they dug a network of earthen ditches, and they devised schedules to enable each family to get equal access to the water. It's simple but effective. 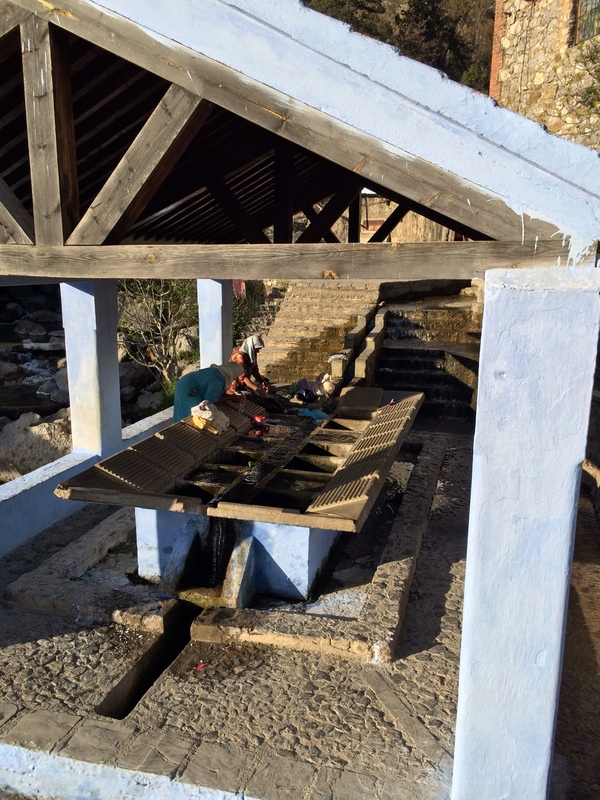 The water flows downhill from the spring, and for three hours per week each family can dig out a dirt barrier and let the water flow into their plot (filled in turn with its own small channels). The four elders who manage the complex scheduling of this operation each get an extra three hours of water per week for their labors. The 60 families survived. But Omar said life in the village just 15 years ago was primitive. There was no electricity. No phone service. No paved road, so even reaching the village was difficult. He said what turned things around was that Hillary Clinton decided to visit the dunes with Chelsea. This was around 2000, when Hillary was still First Lady. In anticipation of her arrival, the Moroccan government spiffed up the place, grading the roadbed and installing some kind of telecommunications link. Hillary and Chelsea buzzed in and out in just a day, but the impact on the village was long-lasting, as the government subsequently built on those inital improvements. Most importantly, they paved the road to Rissani (the ancient capital of the Maghreb region, which lies about 40 km down the road and IS served by good road.) Around a dozen years ago, the first of the village families decided to begin accepting guests into their family homes. The Seggaouis were among them. 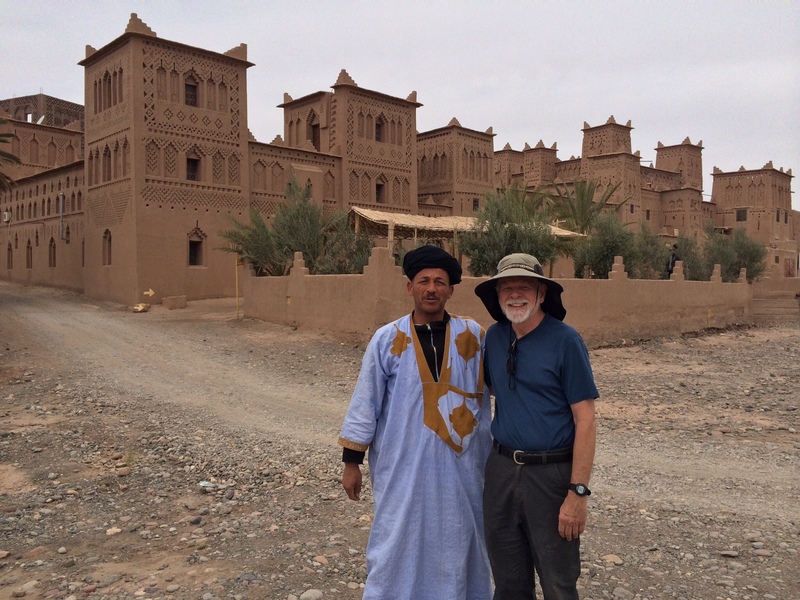 It took Steve and me about 30 minutes to drive from Rissani to the Seggaoui's place (Maison Guesthouse Merzouga). The village itself is still pretty sketchy (dirt roads, no signs). But the guesthouse exceeded my expectations, already high given the glowing reviews I'd read online. Though made from mud mixed with straw, the workmanship looked expert. Each of several huge public salons were wifi-equipped and had ceilings probably 20 feet tall. Dozens of rugs and other decorations covered the walls. Our big room was tastefully decorated with a comfy king-sized bed. We were greeted by L'Hassan, the second-oldest brother and the most ebullient of a charismatic family. He led us to terrace with a great view of the dunes, served us mint tea, and as we watched the setting sun paint the desert deeper and richer shades, we chatted about everything from his betrothal and marriage 19 years ago to the 13-year-old wife his family had picked out for him (now the mother of his five children ranging from 2 to 15) to the parallels between Islam and American Mormonism. L'Hassan extolled the virtues of the 4WD desert tour that his family also offers, but the pedestrian tour with Omar appealed to us more. We did that, and afterward I wrote my post about our rug-buying adventure Friday. Then we organized our backpacks for our camel ride and camp-out. We'd ridden camels once before, for a short excursion in Aswan (Egypt), but this was a much more elaborate adventure, and shortly after 4 p.m. as we drove to the staging area (a few minutes from the guesthouse), my adrenaline was flowing. 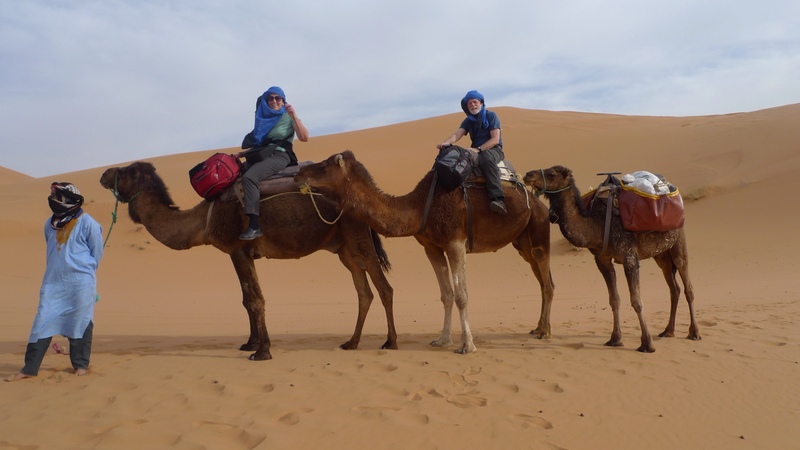 We had four travelling companions — a genial pair of lawyers from Brooklyn, their gregarious 9-year-old daughter, and her nanny — born in Morocco but even less experienced at camel-riding than S and me. Omar the Camel-Driver was a thin, affable guy with limited English. He and his assistant helped each of us on one of the pile of blankets that comprises the bulk of a camel-riding saddle in this part of the world. From our Egyptian experience, both Steve and I had developed a high opinion of camels. We like the deep sense of calm they exude, and we admire how superbly they're adapted to the harsh desert environment. I like the way they shift their weight to balance on the treacherous footing provided by the dunes; the way they bring their heads and necks down to lower their center of gravity, or stretch them high to see distant landmarks. I love their huge eyes and lashes and the way their mouths often curve into something resembling a smile. I had remembered camel-riding as being a pleasant rocking experience, and it was that at first as we left the village. 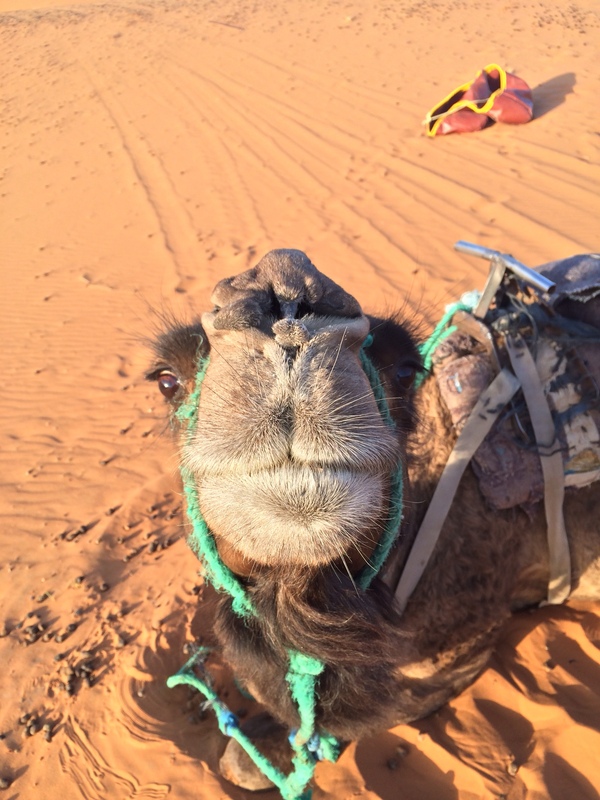 But when the camels picked up speed, the ride felt more like being an a rocking horse on crack. Moving through sand dunes involves a lot of climbing and descending, and to keep from falling off, I tightly gripped the metal bar at the front of the “saddle.” It was fun. But after a few minutes, it was NOT comfortable. After less than an hour, my hands were cramping from the effort, and my lower back was informing me it would make its displeasure at this treatment known later. Still, the glories of the scenery made the discomforts fade into insignificance. The sands of Erg Cheggi are a beautiful peachy tan. In the warm light of the sinking sun, the landscape reminded me more than anything of flawless naked flesh, smooth and sensual. Some patches were pristine; others sprouted small patches of dried grass or sprinklings of camel poop (which looks a lot like dried out meatballs.) It's strange and rare to be anywhere in the world today with no sharp angles. But this place is all long curving arcs and soft bends. It felt swollen with sinuous allure. We reached the guesthouse's bivouac site a little before 6 and had a half hour or so to climb to some of the nearby heights. Our 9-year-old traveling companion scrambled up and raced down the slopes, trying (with some limited success) to slide down them. Then we all adjourned to the tent compound, where we drank mint tea and talked and ate chicken and vegetable tagine and orange slices dusted with cinnamon. When I slipped out to pee in the sands, the inky night provided easy privacy. Switching off my flashlight made me invisible and it allowed the star-crammed sky jump to center stage. Steve and I had our own capacious tent holding a large, comfortable foam mattress. We slept well, waking before dawn to hike to a high point where we could catch the dawn. The wind was blowing hard enough to erase our footprints after just a few minutes but not so hard as to mar the beauty of the morning. 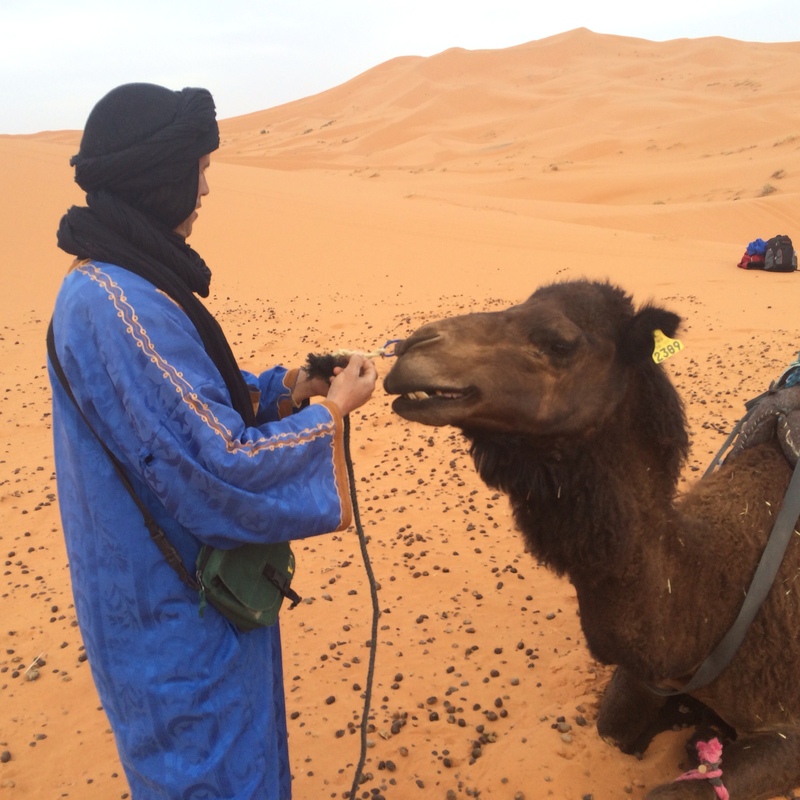 Once the sun was up, we packed up, climbed onto the camels again, and headed back to the village. We showered at the guesthouse, ate breakfast, loaded the car, and drove north through landscape that often vied with some of the most dramatic in the American West. We were far more comfortable than we had been on the camels. But I'm pretty sure it will be the austere landscape and joint-wracking ride I won't forget. Steve's a multi-faceted guy, and a multi-talented traveling companion. Although I do most of the planning, he drives, and does it well. And when it comes to bargaining, he rocks. That's not to say he's much of a shopper. Neither of us is. 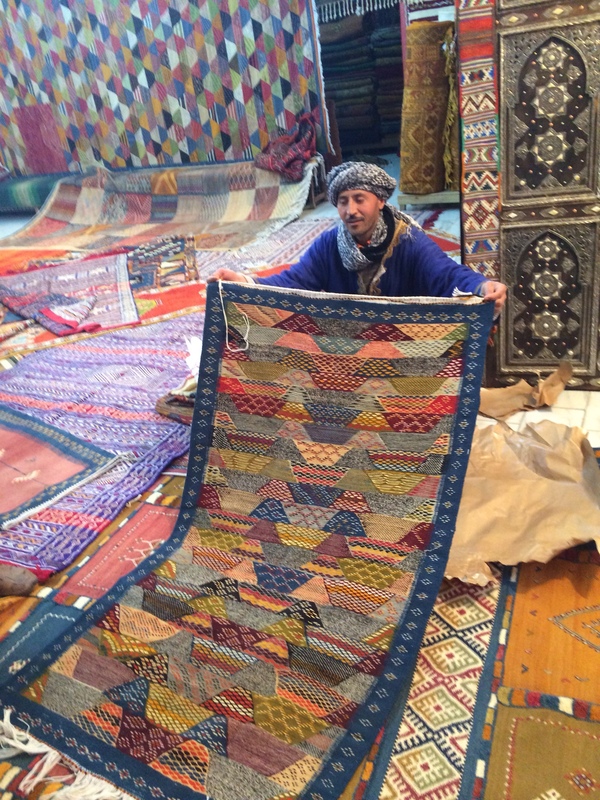 But before embarking on this trip, I'd pointed out that we might want to buy some rugs in Morocco. Our living room rug has been peed on by at least a half-dozen puppies over the years. It looks pretty shabby. And we've never had any rug on the wood floor of our bedroom. I measured what we'd need for those spaces, and Steve grudgingly consented to do a bit of looking. We went to the artisanal center in Marrakech (one of the few places in Morocco to sell rugs for fixed prices) to get some idea of what things cost. 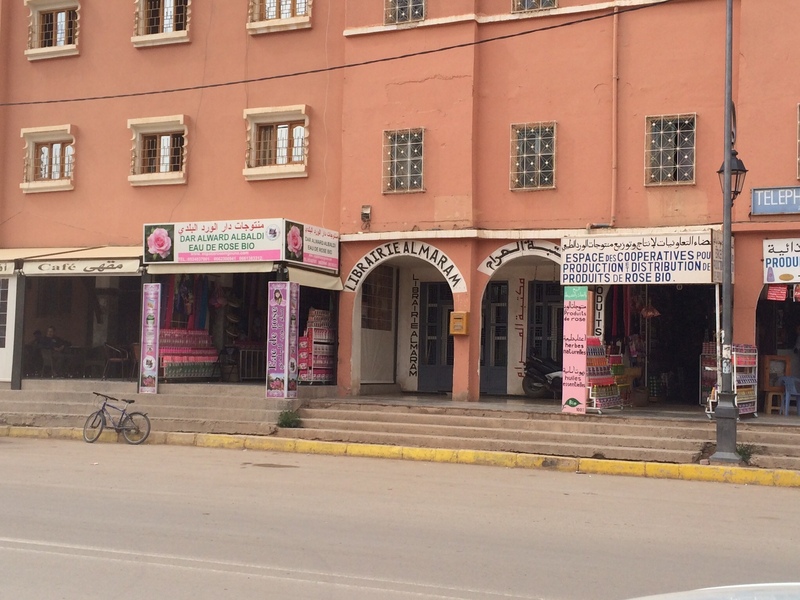 But we decided to save the actual rug-shopping for Tinghir, home to a Maison Berbere outlet that our guidebook recommended. After we checked out Friday from Philippe's amazing kasbah, we headed there, arriving around 9:45. Someone served us the ever-present Moroccan mint tea, then the rose-water guy hauled out item after item illustrating various aspects of Berber culture — a duffle bag made out of ornamented camel skin, a chart of the symbols used by various Berber tribes, and so on. All this laid the groundwork for the chief salesman, a tall commanding man named Omar, to begin the Presentation of the Rugs. He ordered one to be brought out and explained its fabrication and the significance of its patterns. One after another followed, each more beautiful than the next, until almost all of the marble floor was covered, a riot of glowing color and textures. We explained the small space available for the bedroom rug, and they were unperturbed. In short order, they'd brought out a 3- by 5-foot blue-bordered example whose complex patterns struck both of us as pleasing. We sat down though I made it clear Steve was calling all the shots in this transaction. (I'd learned years ago, when we were traveling in China, how steely and sophisticated his bargaining technique can be.) Omar fished out a a piece of scrap paper and wrote down a number that startled me by its magnitude. But a minute later, he stated that it was their custom to give a special discount to the first customers of the day. So he crossed out his first number and wrote down another, 5% lower. Steve pondered for a moment then said the rug was obviously of the highest craftmanship. He talked about how some people in California, where we lived, were able to afford Mercedes Benzes and Bentleys, but he was man of more modest means and drove a Toyota. (Actually, he drives a Chrysler but he figured they wouldn't know what that was.) 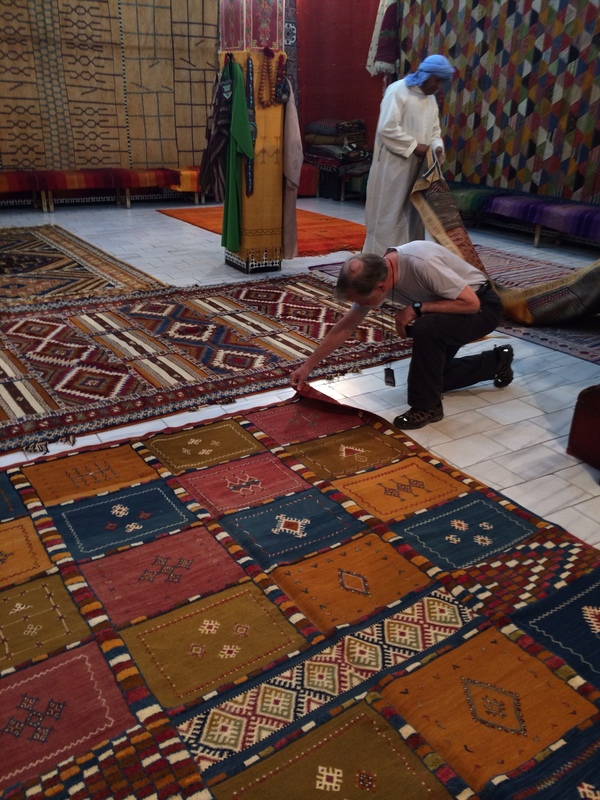 He said he wouldn't want to insult the Berber people by naming a price that might make them think he didn't appreciate how nice the rug was. Omar insisted he would not be offended. So after more reflection, Steve wrote down a number that was a little over a third of Omar's original figure. Omar didn't flinch or reel. He was cool. But he crossed out both his number and Steve's number and said the former was too high for Steve, but the latter was too low for him. He gave Steve back the paper and asked if he could give him a better price. Part of what I think makes Steve so effective is his ability to sit and think, silently. I found it utterly nerve-wracking. But the Berbers never acted irritated or impatient. From time to time, Omar would murmur something encouraging; talking about how long a rug like this would last (forever) or how little we would regret such a purchase. After what felt like an eternity, Steve increased his number to one about 45% percent of Omar's initial number. “Give me your final offer! Best offer! Just a little higher,” Omar wheedled. Another eternity passed, and gravely Steve increased the price by $25. Omar stuck out his hand and then smiled broadly. He shook hands with me. Happiness washed through the room. Steve and I dashed out to get cash from an ATM machine, and I thought for sure we were done for the day. 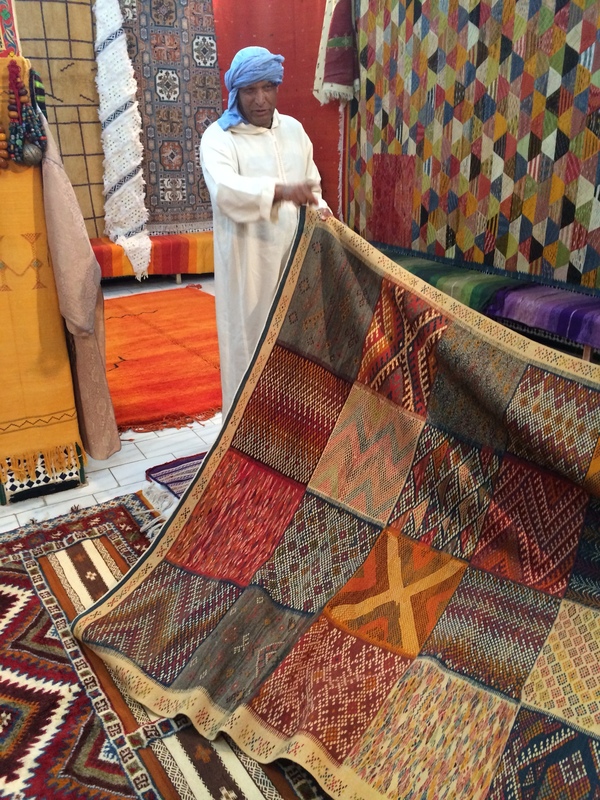 But upon our return, Omar broached the possibility of our acquiring a larger rug. To my amazement, Steve seemed game, and the whole process essentially repeated itself — more agonizing over the right size, more figures written down and crossed out, more pleas for Steve's best offer. At one point, Omar laughed and shook his head and said that Steve should come to work for them. Steve later told me that he thinks they were flattering him, but I think they were genuinely impressed. By the time we walked out of the shop with our two bundles (compressed down into packages that are amazingly compact and not that heavy and will fit into the extra duffle bag we brought with us), it was 11:15. Although we hadn't begun the day's touring and sightseeing, it felt like we'd already learned a lot. Maybe 10 minutes later, S and I were deep in an almost Irish green paradise. The palm trees were big, and there were olive and other tall trees. The paths twisted and turned, and the thought occurred to us that we could soon get very lost. In the end we didn't; the hotel guy proved to be right. We glimpsed our target, made our way it, and it lived up to its reputation. As we were leaving, we passed a couple dozen French tourists waddling in the wake of a Moroccan guide (later we saw their big fat bus out on the road.) It struck me that if you're shepherded in a group, you never have adrenaline-charged moments where you don't know if you'll ever find your way out of the palmery. But for us, they're part of the charm. At other times throughout the day, we were happy to be independent and mobile, if occasionally stressed. When we got hungry, we stopped at a joint called Cafe Valentine. It didn't look promising, but no better alternatives were at hand. The young guy behind the counter suggested that “Berber omelettes” could be a good light lunch. That sounded safe and fast, so we assented, but a half-hour later, we wondered if we hadn't taken another (figurative) wrong turn. Our host finally reappeared with a basket of light and flavorful bread, however, and then he brought us two tagines filled with a bubbling mixture of baked eggs, tomato and onion sauce, a bit reminiscent of huevos rancheros, without the tortilla or beans. It was delicious, and with a plate of tasty tangerines, a tall bottle of water, and mint tea, the total tab, including tip, came to about $11. Our last detour before heading to Tinghir and the riad I had booked near there was a gorge that cuts off from the Dades Valley (“Route of a Thousand Kasbahs”) and climbs up into the Atlas Mountains. The Dades Gorge turned out to be one of the more striking landscapes we've ever seen. At first it looked to be a cousin to some of the famous geological formations of the West — the Grand Canyon, say, or the national parks of Utah. But soon some striking differences became evident. The walls of the gorge are studded with kasbahs both ancient and new, some under construction. It's not crammed with them. But it somehow made me think of the chalets you might see in the Alps. A third exotic note were the astounding profusions of greenery (fields, trees) on the floor of the gorge — like a splash of Louisiana in the midst of the arrid, rugged American West. The gorge was so jaw-droppingly beautiful it should have been the highlight of the day. But there was one more wonder. 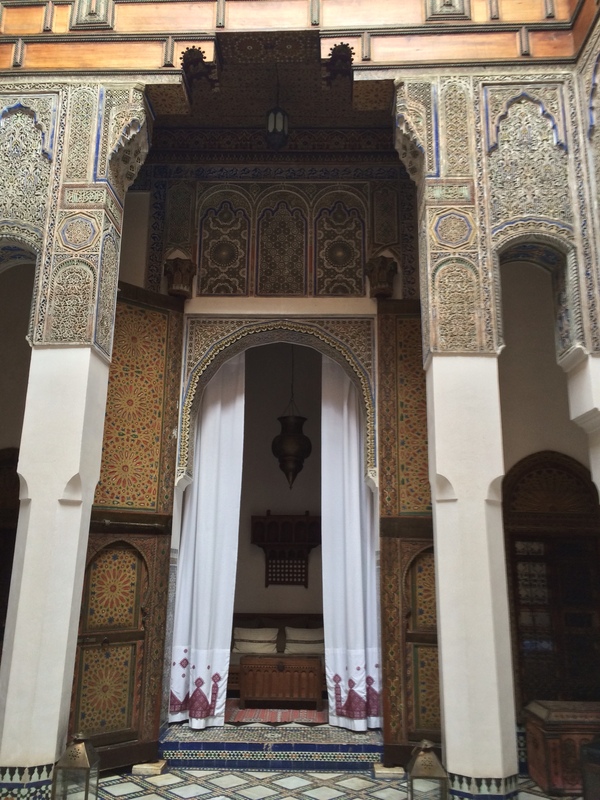 I'd reserved our riad online because it had rave reviews on Trip Advisor and cost only 54 euros (including breakfast). Located outside the center of Tinghir, I could only consider it because I knew we'd have the car. I was hoping for a clean, pleasant room to sleep, but what we got felt like a true oasis kasbah. An aging Frenchman named Philippe completely renovated the old structure seven years ago. He told us he moves regularly between it and France. Thus it feels like his private home, impeccably decorated, graced with a courtyard garden, a rooftop viewing platform, a private jacuzzi and sauna and hammam that put the one in Marrakech to shame. S and I scrubbed up, using that amazing black soap, melted in the sauna, bubbled in the jacuzzi, then went on to a dinner that rivaled some we've had in Paris. We slept well.